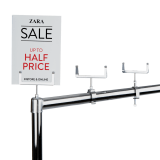 This Reflex Rail Graphic Holder is a must have addition for any retail clothing rail. 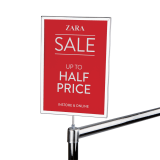 It is the perfect way to display offers, promotions, brands or prices on paper or card. The Graphic Holder is compatible with 98% of rails and will stretch to fit almost any design, so you can rest assured this product will suit your display. The Rail Graphic Holder is manufactured from robust plastic and boasts a flexible design that bounces back if knocked by a customer. The unit attaches to your rail via the built in silicone joint. Graphics are updated via the top opening which is designed with a thumb notch for easy access. The holder is available in three sizes; A6, A7 and 10cm x 10cm. Used these on our sale rails and they worked a treat. Customers could easily see our offers at the end of each rail. We will definitely use them again.